As of Oct. 1, any Class 8 trucks entering service for the first time at either the Port of Los Angeles or the Port of Long Beach must be model year 2014 or newer under a change implemented at the nation’s two largest ports. It is the first in a series of steps the ports are taking to advance clean truck progress under the 2017 Clean Air Action Plan Update, approved last November. New strategies seek to phase out older trucks, with a goal of transitioning to zero-emission trucks by 2035, and intermediate steps in the meantime. 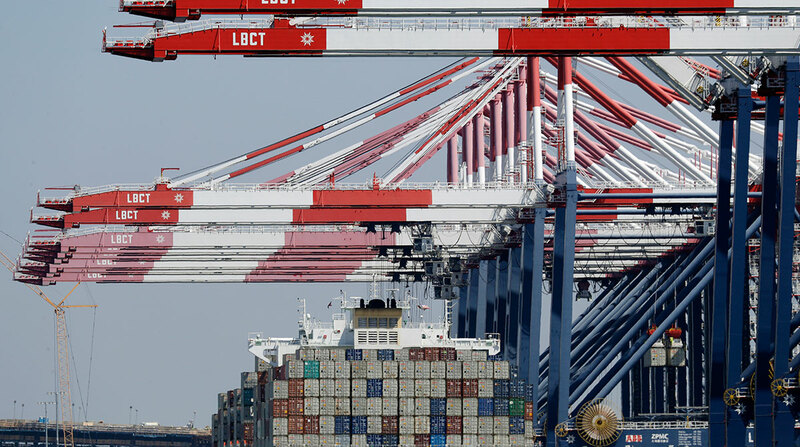 There are about 17,000 heavy-duty trucks registered to operate at the two ports, said Lee Peterson, spokesman for the Port of Long Beach, the second largest seaport behind Los Angeles. “We will start to see some of the older trucks that go out of service replaced with trucks which are built to higher standards and cleaner,” Peterson told Transport Topics. The ports will conduct a truck rate study and feasibility assessments prior to proposing rate changes. Meanwhile, as part of the Clean Trucks Program, all trucks going into marine terminals in the two ports must be on the Port Drayage Truck Registry. The new requirement applies only to trucks registering in the PDTR for the first time. Trucks that are already registered as of Sept. 30 will be allowed to continue operating at the ports, as long as they are current on their annual dues and compliant with emission regulations set by the California Air Resources Board. The provisions were adopted by both the Long Beach and Los Angeles boards of Harbor Commissioners in June and finalized in July. The two neighboring ports coordinate on truck standards and other air quality measures as part of the San Pedro Bay Ports Clean Air Action Plan. Eventually, incentives could include waiving the annual PDTR registration fee for near-zero and zero-emissions trucks and charging a rate for cargo moves by trucks with exemptions for trucks that meet near-zero and zero-emissions standards. Reducing pollution from heavy-duty trucks has played a major role in dramatic clean air progress at the San Pedro Bay Ports. Since 2005, the ports have reduced overall emissions of diesel particulate matter by 87%, sulfur dioxide by 97% and nitrogen oxides by 58%, according to the most recent air emission inventories. More progress needs to be made on curbing NOx and greenhouse gases, Peterson said.